The New Cross Inn | Pub Quizzers | Find a pub quiz near you, now. 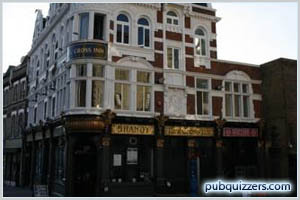 Pub quizzes take place at The New Cross Inn, New Cross on Mondays (weekly) at 20:30. Entry is £1.00, you can have up to 10 people on a team. There are prizes of cash, drinks, food. Happy quizzing! Every Monday night from 8:30pm the New Cross Inn hosts South East London's most popular quiz. Spirits, wine and sweets for 1st, 2nd and 3rd prizes, with the option to gamble for bigger prizes. Shots awarded for certain rounds and a jackpot that goes up every week. Get down earlier for Happy Hour - 50% off drinks from 7pm - 8pm.